Three twitter posts I read in succession were unrelated unless placed in the context of Black History Month. One was from filmmaker Ava DuVernay and the other two about the Texas Hall of Fame and College Football Hall of Fame. In general, they were reminders sports leads the way in opening doors and minds regarding race relations. We all know the stories of Jesse Owens and Joe Louis succeeding at a time the Nazi Germans espoused they were a master race as Hitler threatened the world. Hitler and the Nazis called the United States Olympic team's black athletes its “Black Legion” – not Americans. Owens won four gold medals at the Berlin 1936 Olympics with Hitler watching confounded from his stadium box. Louis avenged his 1936 loss to German boxer Max Schmeling with a 1938 knockout. The United States embraced their triumphs at the Nazis' expense. Jackie Robinson took progress a giant step further into team sports, breaking the color line in Major League Baseball with the Brooklyn Dodgers in 1947, a time when the game was by far America’s most popular sport. But among American athletic teams on the Mt. Rushmore of opening doors and minds, Michigan State football coach Duffy Daugherty's Underground Railroad teams of the 1960s have carved a space out of the mountainside. --- 1960: Minnesota won the national title with five black players. --- 1966: In the Game of the Century that decided the quasi-national title, Notre Dame had one black player on its roster, the great Alan Page, while Michigan State featured the unheard of numbers 20 players with 11 starters, including four College Football Hall of Famers: Bubba Smith, George Webster, Gene Washington and Clinton Jones. --- 1967: USC won the national title with seven black players. --- 1972: USC won its next national title with numbers that jumped to 23 black players. That 1970 USC roster, by the way, had only five black starters: quarterback Jimmy Jones, fullback Sam Cunningham, tailback Clarence Davis, defensive end Tody Smith and linebacker Charlie Weaver. USC's lineup hardly "looked like Grambling" to Alabama fans, which is key to the myths that sold the story line. The game was played on a Saturday night absent a television broadcast. The revisionist history overlooks Alabama assistant coach Clem Gryska refuted the theory that Bryant scheduled USC to lose the game so his fan base could see that it was time for his all-white team to integrate. Alabama's players denied the story of Bryant parading Cunningham around their locker room as an example of what a football player looked like. Years later Cunningham admitted it never happened. I wish I had a nickel for every time somebody told me they failed to previously understand the Underground Railroad's reality versus the USC-Alabama myths (and that the Underground Railroad is worthy of an ESPN 30-for-30). The Alabama false narratives steered credit away from Daugherty, whose teams led the way. His 1965 and 1966 teams were the first fully integrated rosters in college football. In addition to the overall roster, Webster, a rover, and Jones, a running back, combined as the first pair of black players elected team captains without a white player sharing the role. Webster, Jones, Smith, a defensive end, and Washington, a receiver, were the first four African-American teammates from the same class named to the College Football Hall of Fame – and the first such foursome since 1940. Jimmy Raye was the South’s first black quarterback to win a national title as the Spartans’ starter in 1966 when the National Football Foundation named Michigan State and Notre Dame co-champions. Before the Bowl Championship Series and College Football Playoff, the NFF with its MacArthur Bowl was designated as one of the official national title along with Associated Press and United Press International, which in 1966 both proclaimed Notre Dame No. 1. These are facts I researched and presented in my book with the Michigan State Hall of Fame quarterback: “Raye of Light, Jimmy Raye, Duffy Daugherty, the integration of college football and 1965-66 Michigan State Spartans.” The foreword is by Tony Dungy, who considered Raye a pioneer quarterback and mentor coach. Raye went onto a long career a pioneer coach in college and the NFL. --- The Game of the Century ended in an anti-clamtic tie. --- The year before the 1965 UPI national champion Spartans were upset in the Rose Bowl. --- Michigan State's 11 blacks starters against Notre Dame's one doesn't resonate as profoundly as Texas Western's five against all-white Kentucky. Nevertheless, the legacy of those Spartans includes changing the makeup of rosters in the segregated South as well as schools with a history of integration. Among SEC schools, Kentucky was the first to integrate, in 1967; Alabama, despite Bryant saying he "might not be the first but he won't be the third," was tied for fifth; and the last three were Georgia, LSU and Mississippi, in 1972. And as the above 1960 to 1972 national title progression with black athletes I have listed demonstrates, the Spartans pushed schools to expand their rosters to more than merely a half-dozen or so black players. As for those tweets prompting this stream of consciousness, the first was from DuVernay, who directed “Selma” among other films. DuVernay's tweet explained “white privilege” personified with Liam Neeson's racist revenge rant. She asked readers to consider if Will Smith spewed Neeson’s shocking words. That hammered home her point, but in another tweet she brought up First Lady Melania Trump's scantily clad photos in a past GQ Magazine issue. DuVernay asked if people would have readily dismissed the photo spread if it was Michelle Obama. The next congratulated Arkansas defensive lineman Lloyd Phillips for entering the Texas Hall of Fame (he was born in Fort Worth, Tx.). He earned enshrinement as the 1966 Outland Trophy winner; the 10th pick of the 1967 NFL draft, playing three years with the Chicago Bears; and as a College Football Hall of Famer. There was nothing wrong with Phillips’ credentials, but Phillips and Georgia defensive lineman George Patton -- two players from segregated schools -- shouldn't have finished ninth and 10th in the 1966 Heisman voting ahead of Smith and Webster. Notre Dame linebacker Jim Lynch, who won the 1966 Maxwell Award as the nation's best player, has said Webster, his Game of the Century rival, should have won the Heisman that year. 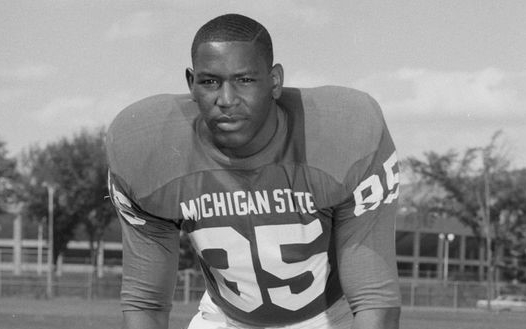 In 1966, Smith was the nation’s grandest defensive star. The college game had never seen a 6-foot-7, 285-pound man that could gallop like a running back. Smith enjoyed greater fame, but Michigan State has always considered Webster its greatest player. The Spartans retired Webster’s No. 90 before Smith’s No. 95. Times have changed in Heisman voting for a defensive player. Case in point: Michigan's Charles Woodson, an African-American, was the first defensive player to win the Heisman, in 1997. In the 1966 Heisman voting, seven white players among the Top 10 players was a reflection of how few black players were on rosters in those days. The three black players in the 1966 Heisman Top 10 were Syracuse running back Floyd Little, fifth; Michigan State's Jones, sixth; and UCLA running back Mel Farr, seventh. The 1-2-3 finishers were Florida quarterback Steve Spurrier, Purdue quarterback Bob Griese and Notre Dame running back Nick Eddy. Again, times have changed. In 2018, the three finalists were two black quarterbacks (Oklahoma's Kyler Murray, the winner, and Ohio State's Dwayne Haskins) and one Samoan quarterback (Alabama's Tua Tagavoila). Among the Top 10, there were six black players, one Samoan and three white quarterbacks. Although white privilege no longer applies to today's Heisman voting, the aftereffects of 1966 voting might explain why Smith is in the Texas Hall of Fame but not Webster and Washington. Smith, who is from Beaumont, Tex., no doubt gained added name recognition for such votes for his his character Moses Hightower in the "Police Academy" movies. Webster was a legend with the Houston Oilers (now Tennessee Titans) as the fifth pick of the 1967 NFL draft. He was the 1967 AFL Rookie of the Year, a three-time AFL all-star and named to the all-time AFL team. Webster's knee injuries had taken their toll by the time of the 1970 AFL-NFL merger. Washington, who was from La Porte, Tex., was the eighth pick of the NFL draft by the Minnesota Vikings. He played seven NFL season in career as two-time Pro Bowler and one Super Bowl. The third tweet involves Washington and his filmmaker daughter, Maya Washington. 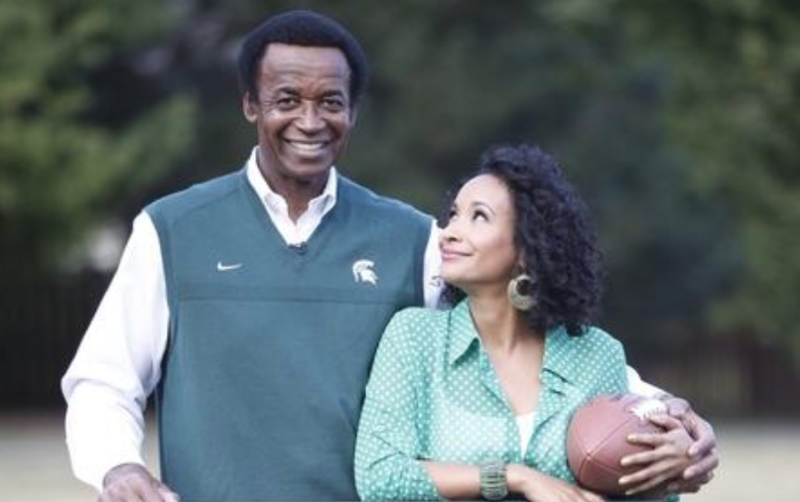 On Feb. 6, the College Football Hall of Fame in Atlanta showed her film, “Through the Banks of the Red Cedar.” It was followed by a discussion with Gene and Maya. Washington's film focuses on a daughter raised in an integrated Minneapolis-area community learning later in life to better understand her father's opportunity to escape Texas segregation with a Michigan State football scholarship. Her story is personal, but many kids today -- black and white -- don't understand how recent was segregation. Bubba Smith and George Webster have passed away, but Gene Washington, Clinton Jones, Jimmy Raye and so many others are still with us. “Men of Sparta” is another film on the 1965 and 1966 teams made by Bob Apisa, the first Samoan All-American player that was a two-time All-American fullback. But previously released films on the 1970 USC-Alabama game entrenched myths. Hopefully, viewer by viewer, knowledge of Duffy Daugherty's Underground Railroad teams is growing, but dispelling myths is difficult. Both "Through the Banks of the Red Cedar" and "Men of Sparta" show us progress in race relations led by sports. We’re not at the finish line, but history moves slowly. In “Raye of Light,” I quote Jesse Jackson on sports opening doors with level playing field. Jackson also explains in the book Michigan State's Underground Railroad teams raised the profile of black athletes. He said he and other black fans rooted for Jimmy Raye to succeed to open doors for future black quarterbacks. Jackson is a polarizing figure, but that doesn’t mean his words don’t ring true. Sports helps us relate to each other. The impact of Duffy Daugherty’s Michigan State Underground Railroad teams can never be overstated.